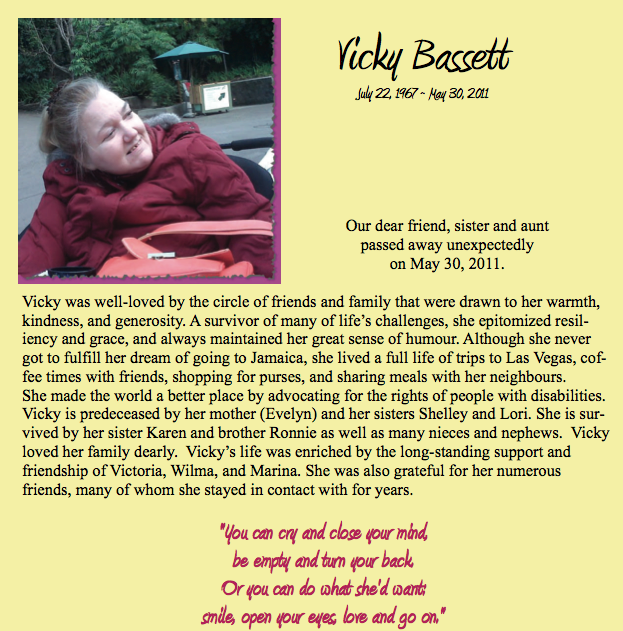 We’ve known Vicky for years and are so glad to have her closer to us these days. She recently sent an amazing poem and also an article “My Life With Having to Have Staff.” We’re thrilled to share these with you. When I started living in group homes it was very confusing. My mom always wanted me to think for myself. She made me do things for myself. But my staff at the group home were bossy. My room mates were bossy. Some times I would have to get really mad to make them listen to me. But then they would just get sick of me. There were some staff I really liked a lot. They wanted to know what I wanted. They wanted to know about what I liked. They wanted to know about what I didn’t like and why. That always made me feel good. But I didn’t get to choose my staff at the group home. So I hoped I would get lucky when someone new was starting. One of things that bugged me a lot happened on the days we had to stay home. The t.v. would get turned on and everyone sat around watching it. I was so bored. I got so pissed off because this happened all the time. And when I would get mad they would try and calm me down and tell me I had to be patient. No one asked me why I didn’t like watching t.v. If they did, I could have told them that I couldn’t see the t.v. And I have a hard time paying attention to anything when I can’t see it. But no one asked me and I didn’t know how to tell them. So I just turned around and took off, stuck in head. Sometimes we would be out at an activity for one of my room mates. I was NEVER asked if I wanted to go. I was just put in the van and off we went. Do you know how boring it is to watch people play lawn bowling? Sitting in the hot sun, bored out of my mind. No one to talk to because they’re all watching or helping with the lawn bowling. Stuck in my head, getting mad. So I would turn around and take off. I heard someone say I have behaviours once. Well…they do too. They have very rude behaviours. Who else would make me do things I really don’t like. And not even bother to ask how I feel about it. It was like this almost everywhere I lived. Except maybe at my moms. So one day I was told by a friend that there was this great apartment in Burnaby. I could live on my own, have my own staff, make my own choices. Great, I thought. Lets do it. The month I was getting ready to move I was in a van accident and had my right arm amputated off. Everyone around me thought this might end my dream of being on my own. Not if I can help it. I have these two friends of mine, who are great at helping me get what I want. When they realized I was okay and I still wanted to be on my own. They made it happen. I chose a very small company. There was only one office person. She really cared about what I wanted. She listened to me and my friends. I was involved in all the interviews for my staff. I asked my own questions about what was important to me. My staff rules were to help me take care of me, the way I want. The rule is still the same. Sometimes I still find it hard to tell people what I really want. I get confused and stuck in my head. So I need to choose staff who know how figure out what I want. So here I am almost 14 years later. There have been good times and bad times. Do I still like living on my own? Oh yeah!! I don’t get bossed around. The secret I think is my friends Liz and Fiona. They helped me every step of the way. They helped me choose the right people to have supporting me. And then helped by reminding the people in my life to find out what I want. They remind me to make my own choices. They weren’t there every day. They are not paid to help me. They help me because they like me. Because I’m a good friend, and that’s what friends do. I think it’s hard for people to let me make up my own mind sometimes. They work so hard to help me. And they care. They don’t want me to get hurt, or sick. But they are good and patient. They let me know when they don’t agree. But support the choices I make anyway. And when we have times where they don’t listen to me. I get angry. And then they listen, and don’t get mad back. They know they need to listen to me. That’s my rule. Because it’s my life, they need to listen to me. If I had any advice to give people like me who need support staff, I would say, ”think for yourself, and talk a lot. Keep talking until someone listens.” When you find good people, tell them that. What an insightful, witty and important post! Thanks so much for sharing Aaron!